Work has been crazy the last few weeks. I've been leading a culinary tourism campaign (awesome, right?!) that links local restaurants to producers and growers in our area. It will highlight restaurants that are already serving local, and encourage restaurants who aren't. I am excited to see where this project goes! Here is the website I've been working on. It launched yesterday, part of the reason I've been so busy! Writing content and designing a website from scratch is no joke. All this work hasn't left me much time for baking. 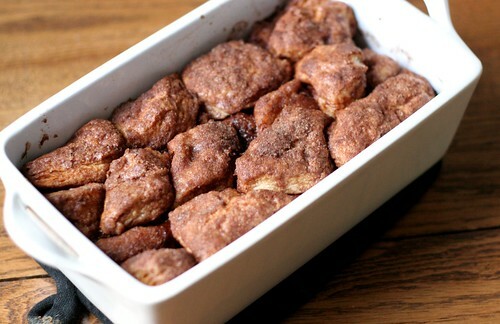 I needed an easy dessert one night, so I found this Monkey Bread recipe that is made from a can of biscuits... and I am not ashamed. 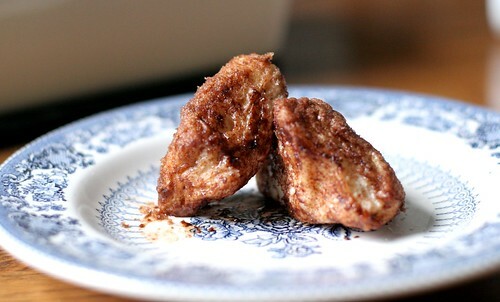 You just make a cinnamon sugar mixture, then melt some butter. I set up a little station with my bowl of melted butter, cinnamon sugar and a loaf pan. 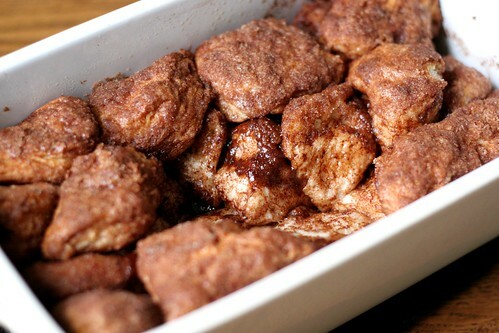 Cut the biscuits into quarters, dip the pieces in melted butter then roll them in cinnamon sugar. Yes it's true. Line up those little beauties in a loaf pan. You will probably end up putting a few pieces on top of the first layer... unless you eat them of course. I'm just saying. It bakes up beautifully. The melted butter caramelizes the sugar and creates this gooey center just dripping with a syrup-y cinnamon glaze. I mean you can just imagine what biscuits dunked in melted butter tastes like. It's out of control. I set this pan of goodness out for our weekly movie night. People were just picking the pieces right from the pan and going to town. 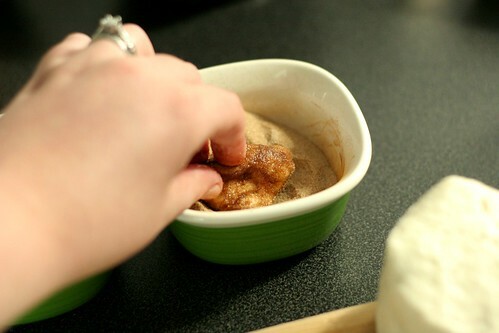 I think I like this recipe so much because the only thing I don't keep stocked in my kitchen is the can of biscuits, so it's really easy just to run out and get one thing in a pinch. So if you need a super easy dessert you can make in just a few minutes, this is a good one. Heat oven to 400 degrees. Spray your loaf pan and set aside. 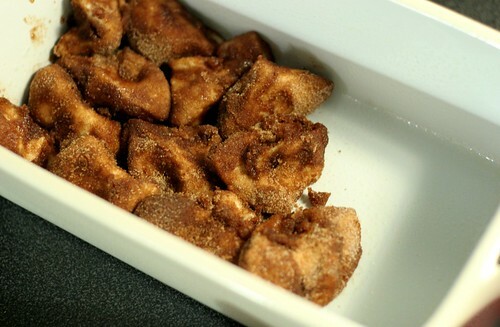 In small bowl, combine sugar and cinnamon and mix well. 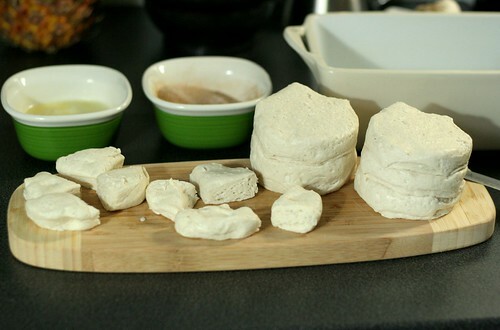 Separate dough into individual biscuits and then cut them into quarters. 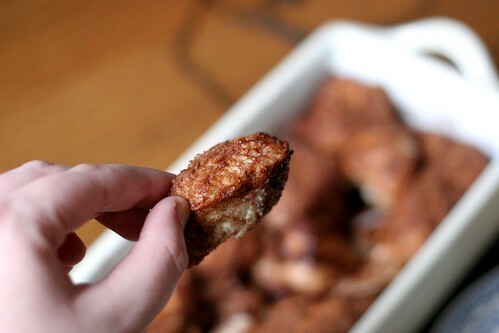 Dip each quarter in the melted butter, then roll it in cinnamon sugar mixture. Arrange in the loaf pan. You may end up putting a few pieces on top of the first layer. 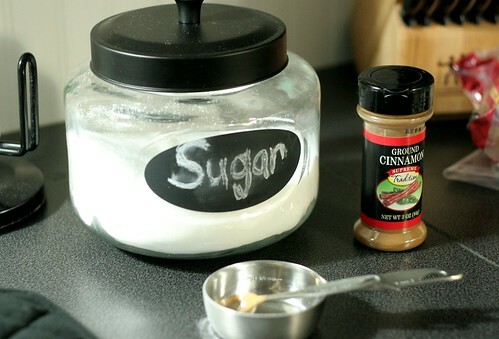 Bake for 15-18 minutes and let cool 2-3 minutes just so the sugar doesn't burn you. At this point, you can loosen the edges and place the whole loaf on a serving platter. Or let it cool a few more minutes and serve it right from the loaf pan. Thanks for the recipe! The loaf pan was a great idea and the bread came out wonderfully. It truly is a shame how fast runs out before and after baking ;)!